Dubbed the “UK’s hottest new export” by What’s Trending, singer-songwriter Wolfe Jackson moved to America in 2014, in three years the Americana/Soul artist sold-out multiple shows at New York City’s most prestigious venues. 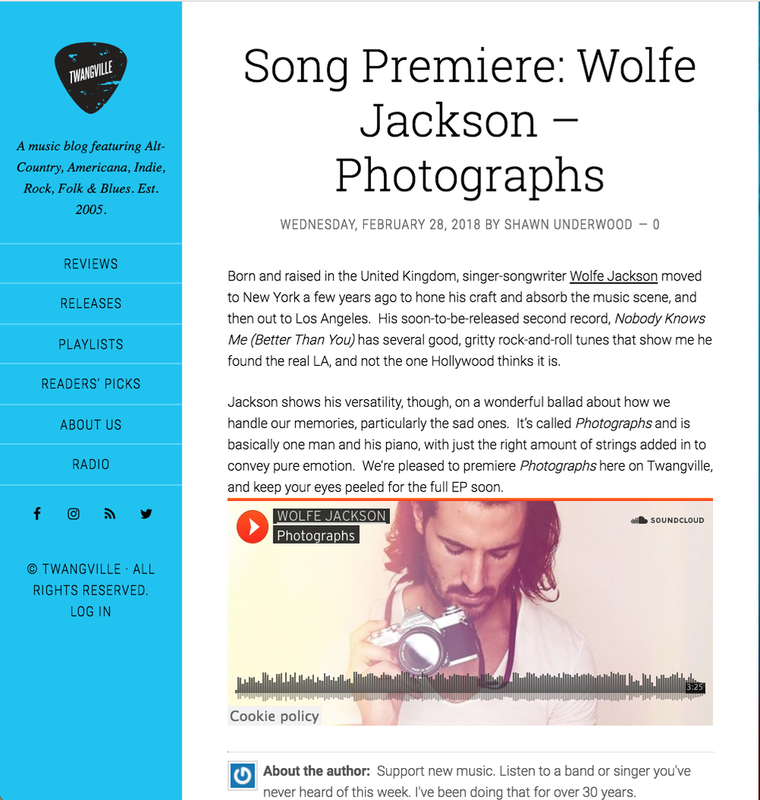 After embarking on a crowd-funded U.S. Tour last summer and relocating to Los Angeles, Jackson released singles “Photographs” & “Comfort Love” earlier this year. The singer’s highly anticipated debut EP “Nobody Knows Me (Better Than You)” was released in May 2018, celebrated with a sold-out release show at Hollywood’s Hotel Café. "The UK's hottest new export"
"Wolfe's sultry soulful vocals and romantic lyrics are at the core of this classic, feel good track which once you hear, you'll be playing on repeat all day." "Wolfe effortlessly captures and blends R&B and Pop tones with a deep and honest thread of Soul that results in a completely truthful and incomparable sound." Photography by Max Papendieck & Meg Remien. WOLFE JACKSON FOLLOWS UP ON HIS SOLD-OUT CONCERT AT GIBSON GUITAR’S HOLLYWOOD SHOWROOM WITH AN EXCLUSIVE & INTIMATE HOLLYWOOD SHOWCASE. PERFORMING AN EXCLUSIVE SET OF NEVER-HEARD-BEFORE MATERIAL ALONG WITH ALL YOUR FAVOURITES, WOLFE JACKSON MAKES HIS RETURN ON MARCH 30 AT THE STUDY, HOLLYWOOD. IF YOU LIKE DRINKING WHISKEY AND LISTENING TO THE SOUND OF ROAD TRIPS, DESSERTS AND A TIME LONG BEFORE OUR OWN, THIS ONES FOR YOU. PARTNERING WITH NINE BANDED WHISKEY, WOLFE IS OFFERING $5 COCKTAILS FOR ALL ADVANCED TICKET HOLDERS. GRAB YOURS TODAY VIA THE LINK BELOW! Be a part of something special this summer. join wolfe on tour. I NEED YOUR HELP! Be a part of something special and support the debut album, U.S. tour and movie-documentary with KICKSTARTER. This summer Wolfe records his debut studio album, and then begins touring across the United States, followed by a film crew to make a movie-documentary about the whole journey from start to finish. learn more by clicking below. Remedy was released March 17th and premiered by Bello Magazine Online and then featured on What's Trending.com shortly after. Check out the articles and interviews below. listen to wolfe's debut single "remedy" on soundcloud now! CATCH A SNEAK PREVIEW OF THE REMEDY EP ON SOUNDCLOUD NOW!